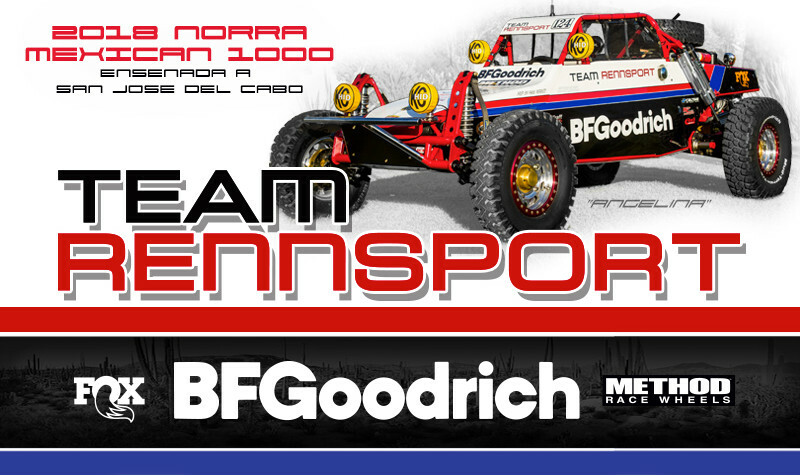 LONG BEACH, CALIF. (April 13, 2018) — With less than two weeks to go before the drop of the green flag for the 2018 NORRA Mexican 1000 rally, BFGoodrich Team Rennsport is ready to tackle its annual 1,300-mile, five day trek down the rugged Baja peninsula. Perhaps now more than ever. With A-list support from BFGoodrich Tires, Method Race Wheels, Fox Racing Shox, MasterCraft Safety, Brown & Miller Racing (plumbing and wiring), Brian Coats Motorsports, Eibach Springs, Weddle Industries, Rancho Peformance Transmission, AEM Electronics, Maglock, KC Hilites and Caltime Metals, the Long Beach, California-based Team Rennsport will ride again after in 2018, making its return to Baja in 2017 after 24 years of being dormant. Known as “The Happiest Race on Earth,” the NORRA Mexican 1000 is a vintage-themed rally that starts April 22nd in Ensenada, Baja Mexico and finishes 1,369 miles later on April 26th near the white sand beaches of San Jose Del Cabo. HISTORIC PRESENCE: After competing in the 1990 and 1991 races, the #BFG Team Rennsport #124 car made a weekend-long appearance at last month’s 50th anniversary BFGoodrich Mint 400 in Las Vegas, including being part of the BFGoodrich display on Fremont Street (top). Also returning to support the 2018 NORRA Mexican 1000 race effort is the team’s vintage three-seat Ford Bronco pre-runner, which is maintained and driven by Brian Coats. 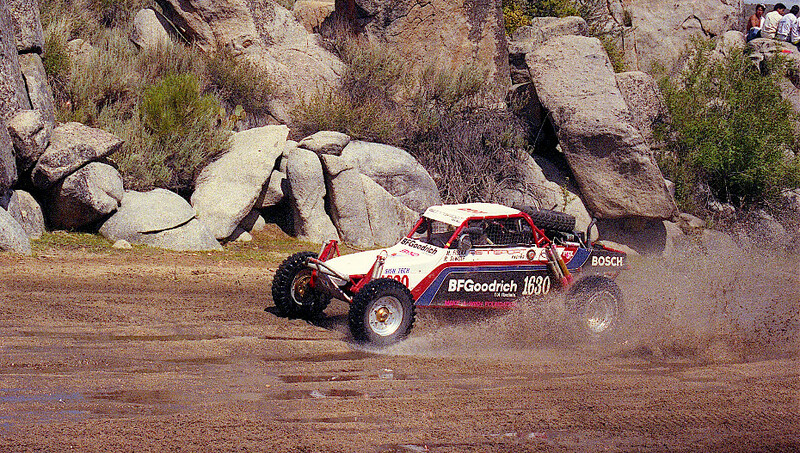 Bolstered by the growing vintage off-road scene, after a 20-year absence BFGoodrich Team Rennsport original members Marty Fiolka, Ron DeWolf and Paul Perrizo found their unique, one-of-a-kind Finishline chassis in late 2016 thanks to an ad on Craig’s List. Located near the Mexico/California border, the neglected car was restored well past its former glory with the help of additional team owner Brian Coat and his Huntington Beach, California-based Brian Coats Motorsports. Despite a lack of significant test time, at its 2017 NORRA debut the lightweight car and drivers Fiolka, DeWolf, Coats and desert veteran Justin Blower raised eyebrows with a surprisingly competitive pace right out of the box. The car was among the class leaders when a driveline failure ended their effort more than 800 miles down the course. 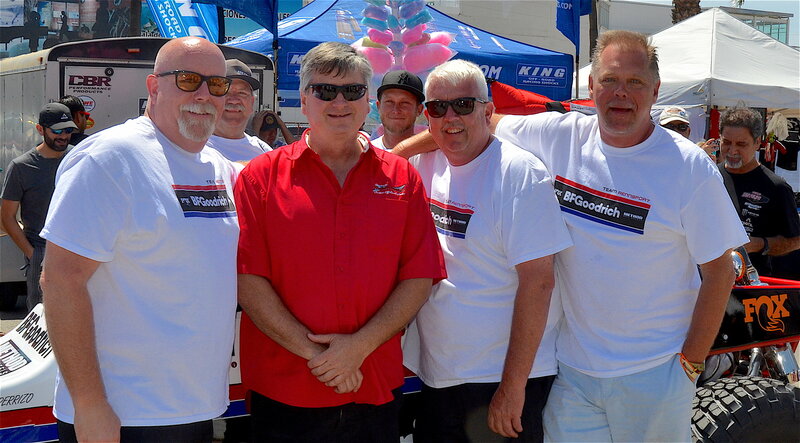 For 2018, a year of additional preparation, testing and a significantly enhanced chase and spares package are in place for a BFGoodrich Team Rennsport drivers list that includes Fiolka, DeWolf, Blower and the return of former teammate Chris Pauslen, the former owner and co-founder of C&R Racing and the driving force behind the IMIS Motorsports Show in Indianapolis. The car now carries an updated transmission package thanks to Weddle Industries and Rancho Performance Transaxles, a dry sump oil system installed by Adam Wik Racing engines and replumbed by Brown & Miller Racing Systems and reworked suspension by Fox Racing Shox and master tuner Tommy Morris. THEN AND NOW (Take 1): Nicknamed “Angelina” for causing at least two divorces among team members in the 1990s, the one-off Team Rennsport single-seater was unearthed after being spotted in a Craig’s List ad. Formerly a Class 1-2/1600 car (top) when originally raced, the car was updated by Brian Coats Motorsports to compete in NORRA’s Vintage 4-Cylinder Buggy category. First raced at the 1990 Parker 400, the team’s unique Finishline single-seat chassis originally competed in the 1-2/1600 class driven by Fiolka, DeWolf and Craig Stewart. 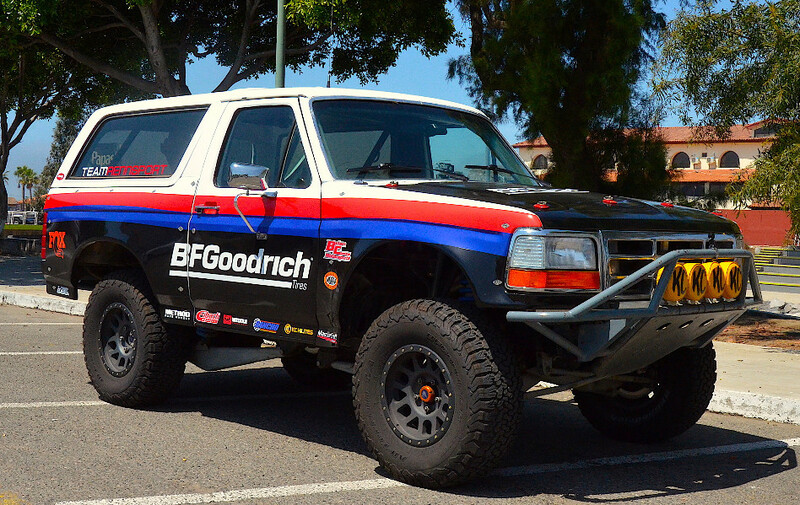 It proudly wore the iconic white, red, blue and black BFGoodrich team livery that was shared by the late Bob Gordon’s Class 1 Chenowth and Robby Gordon’s Ford Class 8 truck. The car is knicknamed “Angelina” for causing at least two divorces among team members in the early 1990s. 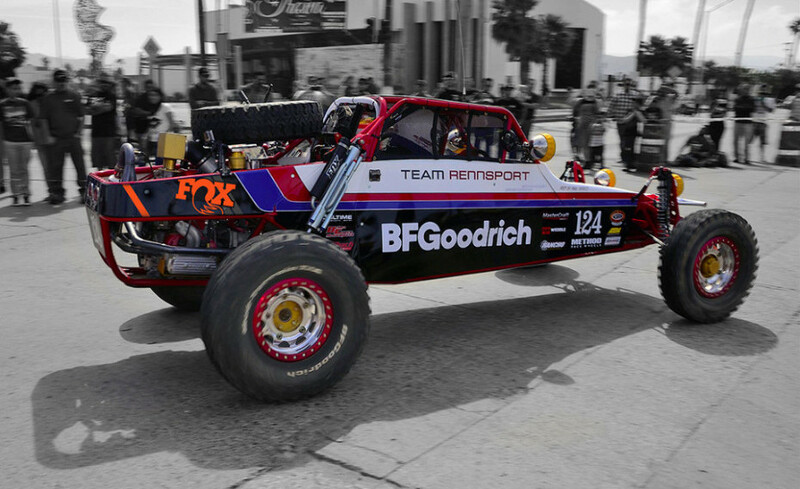 The #124 Team Rennsport entry will once again sport the vintage BFGoodrich factory paint scheme; both in tribute to its own history and also in memory of “Baja” Bob Gordon — a longtime team friend and mentor who passed away in 2016. In fact, the single-seater will run a Wik-built, 1980’s-era high performance VW engine that the late Baja champion gave to Fiolka for a historic 2014 NORRA project. The special power plant is referred to as the “Gordon Engine” by Team Rennsport. THEN AND NOW (Take 2): Original Team Rennsport members included co-owner Ron DeWolf, Stewart’s Raceworks founder Craig Stewart, veteran crew chief Paul Perrizo and 2014 Off-Road Motorsports Hall of Fame (ORMHOF) inductee Marty Fiolka (R-L). 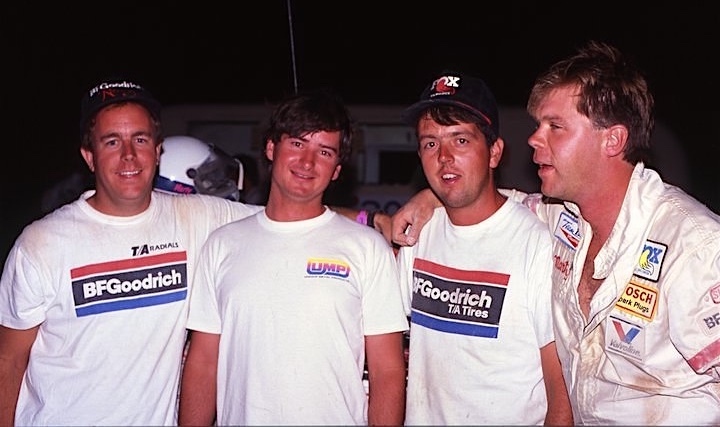 DeWolf, Perrizo and Fiolka, along with team co-owner Brian Coats, will reunite for the upcoming 2018 NORRA Mexican 1000. 2018 YOKOHAMA NORRA Mexican 1000 – RALLY ALERT 9 – NORRA Releases Full Course Maps For Cars & Bikes!